Sake is the national drink of Japan and is rapidly becoming a popular choice for drinkers around the world. Japan Centre prides itself on its extensive supply of sake, from the varied offerings of master brewers such as Gekkeikan to rare, award-winning sake from smaller suppliers. Whether you’re a sake connoisseur or a complete beginner, let the Japan Centre be your guide to the rich world of sake. Standard sake is a comparatively inexpensive, everyday variety of sake. It can be thought of as the sake equivalent of table wine. Standard sake is brewed using modern, quicker fermentation methods. Distilled alcohol is added after fermentation for a clearer, cleaner flavour. Standard sake is the most versatile of all the sake varieties. It can generally be enjoyed on any occasion, served cold, at room temperature, or gently warmed, either on its own or with any entree or main course. A higher quality than standard sake, Honjozo is made with rice polished to between 60-70% of its original size. Brewed alcohol is added after fermentation for a cleaner, more delicate flavour. Junmai is of a similar quality to Honjozo sake. No distilled alcohol is added to Junmai, so its flavours are fuller and more mellow. Tokubetsu is a Japanese word meaning 'special', and it can apply to both Honjozo sake and Junmai sake varieties. Tokubetsu sake is of a higher quality than other Junmai and Honjozo sakes. Tokubetsu sake uses higher quality rice and is polished to 60% or less of its original size. Brewed alcohol is then added after fermentation for Tokubetsu Honjozo, or left out for Tokubetsu Junmai. Ginjo is the second highest sake grade. It is made using slower, older brewing methods and rice polished to at least 60% of its original size. Brewed alcohol is then either left out for Junmai Ginjo, or added for regular Ginjo. The highest quality of sake available. Daiginjo is brewed with rice polished to less than 50%, with brewed alcohol left out for Junmai Daiginjo, or added for regular Daiginjo. The Japan Centre is a direct supplier of Gekkeikan sake in the UK. At Japan Centre Panton Street, we are pleased to have one of only a few sake sommeliers in the UK as our expert in store Sake Buyer, Naoyuki Torisawa. He has selected some of the best sakes, from the finest breweries to be imported directly from Japan, creating one of largest ranges of sake in the UK. If you have any questions about sake, how it is made or which bottle to buy, Naoyuki and the team at Japan Centre will only be too happy to help. Are you curious to experience Japanese sake for yourself, but unsure about where to start? Alternatively, are you a knowledgeable sake connoisseur who enjoys a cup or two of a particular variety every now and then? In either case, japancentre.com’s sake subscriptions could be perfect for you. 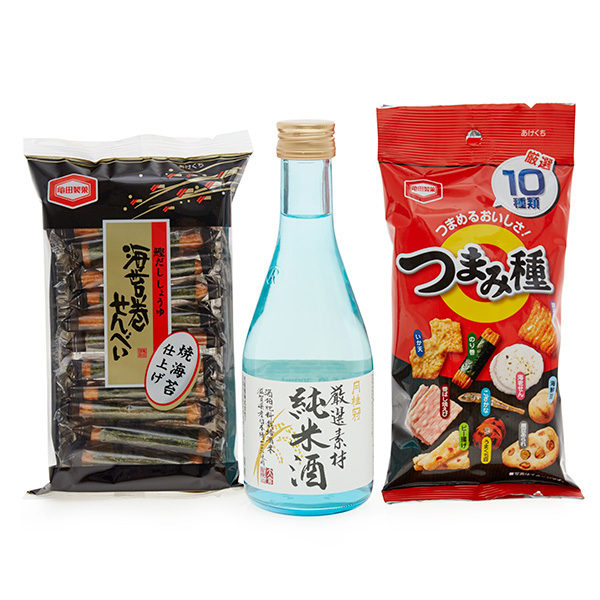 With our Classic Sake Subscription Box, customers will receive a different type of sake each month as well as a selection of savoury snacks specially chosen by our experts to compliment your sake most perfectly. If you know exactly what your sake preferences are, our Select Sake Subscription might be a better fit. With this subscription, customers sign up by choosing what they would like to receive from a special selection of available standard and premium sake. Customers will then receive that same order every month, and never have to worry about being without their favourite sake again. Find out more about japancentre.com’s sake subscriptions by clicking below. Gekkeikan are one of the world’s top brewers of sake, with a history dating back to 1637. At Japan Centre, we're proud to be Gekkeikan's foremost direct supplier in the whole of Europe. We reveal the story of these revered sake brewers in our special blog post. With World Sake Day being celebrated on 1st October, we reached out to Japan Centre store manager and our very own sake sommelier Naoyuki for his top 5 sake recommendations. With his expertise and insight, you'll be able to choose the perfect sake to join the festivities. Ozeki Sake was first established in 1711 in Imazu, Hyogo Prefecture. As time has gone on, Ozeki has cemented itself as one of Japan’s major sake brewers. They were also one of the first Japanese sake brewers to set up a facility in the US (in Hollister, California, in 1979), making them well positioned for introducing authentic sake, made by Japanese brewers, to the US and the rest of the world. The Shirataki Shuzo brewery was established in 1855, based on founder Minatoya Tosuke’s desire to brew sake out of the clear mineral water in Echigo Yuzawa Town, Niigata Prefecture. The combination of this natural charcoal filtered water, locally-grown Koshihikari rice, and the same traditional sake making principles that have been passed down through generations, are what makes Shirataki Shuzo’s sake some of the best in Japan.